This makes the dotnet publish to bundle all the required files. Just a note to self on how to run a MongoDB instance using Docker for Windows. This is most likely because of an older ProGuard installation. Download the latest ProGuard from here (v5.3.3 as of this writing). 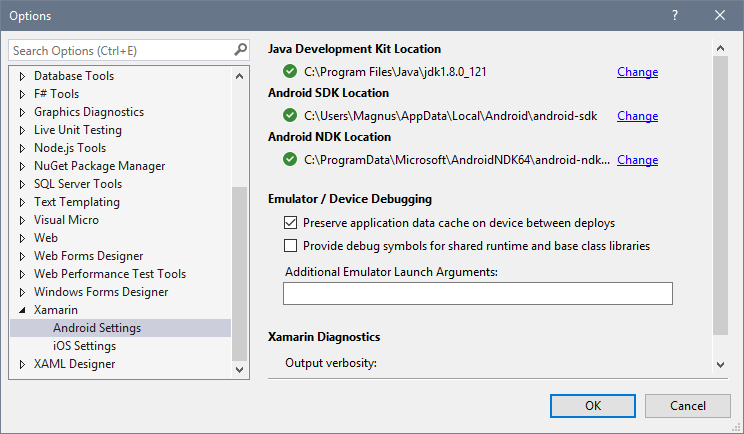 Determine the current Android SDK location that Xamarin is using by checking Tools->Options->Xamarin->Android Settings. In my case it is C:\Users\Magnus\AppData\Local\Android\android-sdk. In the tools sub folder, rename the current proguard to proguard.old. Extract the contents of the latest ProGuard zip file to a folder named proguard. That should do it. Just remember that any changes in the SDK installation (using the Android SDK Manager) will put back the older version, so repeat this after an SDK update. Apparently this can be fixed by telling Android Studio to use JRE v8 (for the IDE, not compiling). One could edit the plist to tell Android Studio to use a different JRE than the default v6, but that’s not recommended by Google. So here’s a workaround; create a shortcut/alias that exports a value to use JRE v8. Change the icon for the alias. Open the LaunchAndroidStudio.command by the “Get Info” command.